A County Antrim nursing home consistently failed to comply with regulations and meet minimum standards of care, an independent review has found. 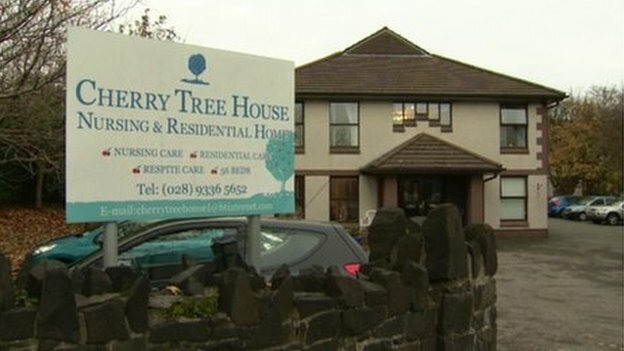 The review into Cherry Tree House nursing home, in Carrickfergus, was triggered after a whistleblower revealed issues with patient safety. She said her concerns were repeatedly ignored by health professionals. Health regulators the RQIA were also heavily criticised in the report. The report said the RQIA should have taken a more rigorous approach with the owners of Cherry Tree Nursing Home. According to the authors of the report, the RQIA’s failure to use the information presented to them led to fundamental aspects of care not being reported. The report recommended the RQIA appoint lay assessors. It also said the RQIA should ensure proper employment controls are in place to prevent certain members of staff, whose actions have already been questioned, from being able to move freely between homes. The whistleblower who was a care worker at the home for several years eventually lost her job. “I feel exhausted, but at last someone has listened to me. I’m delighted, it’s thorough and hopefully it is the start of something bigger,” she said. The report vindicates the whistleblower’s allegations including that her persistent warnings were repeatedly ignored, including by the regulator and managers in the home over several years. The review team confirm that allegations of poor practice should have been acted on a lot sooner, especially on poor care standards, nutrition, staffing and continence care. ‘Surprised’The report also recommended that the RQIA consider how it can effectively ascertain the views of residents families and staff during inspections and that it should review its enforcement policy and procedures in light of developments in other jurisdictions. The independent team was critical of some aspects of how the regulators carried out inspections, with some members of staff describing the practice of announced inspections as a waste of time. Patient’s First Northern Ireland, who represent whistleblowers, described the report as “extensive” but was critical that no one was held to account. Spokesperson Aidan Hannah said: “We have been let down so many times in the past, that we are actually surprised that the report is so extensive. “It supports the whistleblower in this case and is highly critical of the regulators. “However no one is held to account. That is wrong. After all the whistleblower lost her job.” Stewart Dickson, an MLA for the area, said the report highlighted the need for reform of how nursing homes are regulated.